The 1st neutral blender base! Just a touch of vanilla to enhance the flavor it’s perfect for creating smooth, creamy ice blended and smoothies that will not separate. Amazingly your blended beverages with be the talk of the town! It's Amazingly Simple..... one base does it all! Create delicous ice blended and smoothies beverages. 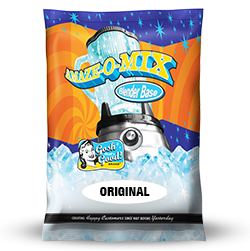 Start with Amaze-O-Mix, add your own creativity with different flavorings, fruits, purees, coffee, juices, milk alternatives, candies, etc. and you will finish with delicious tasting blended and smoothie beverages. It’s touch of vanilla with enhance the beverage’s flavor, prevent separation to remain smooth and creamy to the last sip!. Pair with flavors you already stock to easily expand your beverage menu. For fuller, evenly blended energy based beverages add 1 scoop to blender as well, it’s truly amazing! Your smoothies or blended drinks for sure with be the talk of the town! Combine Amaze-O-Mix with our Deluxe Flavorings & Mixes, fruits, juices, espresso, coffee, and other flavors to make an unlimited number of specialty beverages. Be creative to offer your own signature beverages unique to your coffee house. Great for making blended and smoothie beverages. Not a pre-mix beverage. But used to make many different blended and smoothie beverages. No need to stock multiple beverages mixes. Combine with other flavorings, fruits, juices, coffee, milk alternatives, etc., to create many different beverages. 1 scoop = 8 oz. drink. 2 scoops = 16 oz. drink. 3 scoops = 24 oz. drink. Use Amaze-O-Mix Blender Base with any combination of our Deluxe Flavourings & Mixes with fruits, juices, espresso or other flavors to make unlimited specailty beverages. Be creative to offer your own siganature beverages unique to your coffee house. But we also have many drink recipes, just ask! Add 2 scoops of Amaze-O-Mix™ Blended Base into blended. Add 3 scoops of Gosh That's Good! Rich Classic Chocolate™ or desired chocolate into blender. Add 2 espresso shots into blender if desired. Add desired fresh fruit or 8 oz. of a fruit puree. If using fresh fruit add 5-6 oz. of milk or milk alternative. Add 3 scoops of Amaze-O-Mix™ Blended Base into blended. Add 3 scoops of any Gosh That's Good!Deluxe Flavoring or 3 oz. of desired flavor into blender. Add 8 oz. of your favorite energry drink into blender. 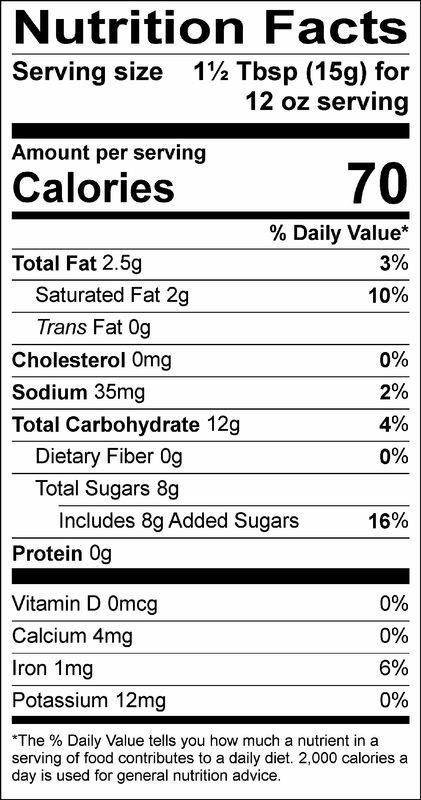 Add 10-12 oz. of ice and blend until smooth. Pour into 24 oz. cup. Sugar, non-dairy creamer [coconut oil, maltodextrin, sodium caseinate (a milk derivative), mono-and diglycerides, dipotassium phosphate, silicon dioxide, soy lecithin], artificial flavor, cellulose gum, salt, tri calcium phosphate (anti-caking agent), anti-foaming agent.